Sapa is the tourist town in the highland in the North of the country. It is one of the main towns of Lao Cai Province and well known as the fog town that attract all tourists. Time for staying in Sapa is always the memorable time for people who come to visit this town whether any time in the year because each moment the town has its characteristic. Communes:There are more than 15 communes in Sapa Town. They are Ban Ho, Ban Khoang, Ban Phung, Hau Thao, Lao Chai, Sapa, Nam Sai, Ta Phin, Ta Van, and other communes. Tourist communes: There are four most famous communes in the tow for tourists who to come to visit. They are Ban Ho, Lao Chai, Ta Phin and Ta Van. Climate: As the words as above, Sapa is the fog town with its characteristic about climate. Located in the highland of the North, this town has the subtropical humid climate and close with the feature of temperate climate. The temperature in here is 13 C degree to 18 c degree in average. The town is the rare place where it snows in the winter in Vietnam. 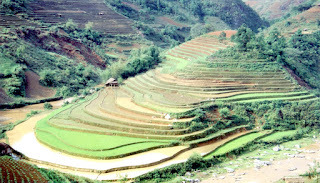 Transportation: Sapa is located far from Lao Cai city center more than 30 km. It is far from Ha Noi capital more than 300 km. It is now very convenient for transportation from Ha Noi to Sapa or from other provinces to this town because the road system is improved. Ethnic groups: There are at least six ethnic groups live together in this town. They are Kinh Group, H’mong Group, Tay Group, Red Dao Group, Tay Group, Giay Group and Xa Pho Group. Fansipan Mountain: It is located nearly 10 km far from the town center. Fansipan Mountain is the mountain considered the roof of Indochina by its high. Many tourists love this place for their journey to conquer this mountain to have the unforgettable time from the peak to view of Sapa and the area rounding. Ham Rong Flower Garden: the flower garden is in the peal of Ham Rong Mountain. It is not so far from the town center. There is a lot of kind of flowers here especially roses and orchids. Beside from here, there is the great view of Muong Hoa Valley in the town. The old church in Sapa: the church is also called as the famous name that is The Stone Church. The church has it’s the special architecture and was built for a long time a go. It is located in the north east of the town. Muong Hoa Valley: it is considered one of the wonderful natural pictures of the town. The valley is located far from the town center nearly 10 km to the south east of the town. Sapa Market: the favorite place is for all tourists who to come to visit, go shopping the local specialties, enjoy local dishes and local culture. The market is in the center of the town. Silver Waterfall: is one of the famous natural landscapes in Sapa that tourists should come to visit. The waterfall locates in San Ho Commune and has its 100 m high. It is far from Sapa more than 10 km. There are different ethnic groups who live together in Sapa Town, so there are many festivals that are happened in the year. The typical festivals in Sapa are mentioned as Roong Poc Festival organized by Giay Group, Sai San Festival organized by H’Mong, Tet Nhay or Dancing Festival organized by Dao Group etc. Sapa is the town that has its many local tasty dishes and specialties. You can find here the mushroom, peach, plum, bamboo shoots, local mustard greens, local cider, and Shan Lung wine and many other specialties. Copyright 2015 @ Vittour Vietnam - Operated by Huynh De Co., Ltd. All rights Reserved.